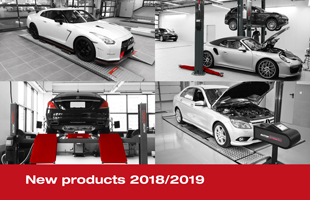 In addition to the existing product portfolio, AUTOPSTENHOJ presented numerous new products at the automechanika 2018. The Masterlift Tele 2.35 Saa is an electro-hydraulic inground lift with telescopic cylinders and 3.5 to. lifting capacity, especially for poor ground conditions, e.g. groundwater or large stones. Thanks to the self-carrying steel cassettes, nothing stands in the way of use as a ceiling installation, not least because of the low installation depth of <1.5 m, from which you can get a proud working height of approx. 2 meters. Both telescopic cylinders have no mechanical connection to each other, so the hydraulic unit can be flexible for different piston distances up to max. 2,600 mm. The synchronization of the two lifting units is controlled electronically. The 2-post lift with 3.500 kg lifting capacity is available in an electro-mechanical and an electro-hydraulic version, which have an universal lifting area from the small car to the T6 long and thus fit into any workshop. The new 4-post lift Major 2.0 from AUTOPSTENHOJ promises a new, stiffer platform profile, perfect conditions for check-in as well as for repair and maintenance, with a platform length of max. 5.5 m and a load capacity of 4 or 5.5 to. Due to the ball-bearing and pneumatically lockable sliding plates which are available in the "-WL" version, wheel alignment is also easily possible, not least because of the adjustable functional surfaces. With the new double scissor MagiX 35 DS, AUTOPSTENHOJ offers a very good lift. Despite the high load capacity of 3.5 to. a drive-over height of only 100 mm is achieved, which also makes it possible to drive over and lift very flat vehicles like the BMW i8. The Emissionmaster SGA400 Combi is an emissions tester that represents the total solution for workshops and testing organizations that want a stable and high-quality exhaust emission tester. Accuracy, stability, flexibility and a practical design are the marks of the combination of our two successful and robust devices. Its flexibility and modern technology enables vehicle testing of gasoline, diesel, LPG and ethanol operated vehicles. The emission master SGA400 Combi is ready for use shortly after switching on, the technology inside is protected from condensation by our Aqua Sense. The large, easy-to-read LED displays the exhaust emissions clearly and well legible. Updates are done via the USB connection quickly and easily. The Opacimeter in this Combi Set is our reliable and high quality Emissionmaster SST100. Over the years, it has always been brought up to date and is used very often. AUTOPSTENHOJ Emissionmaster - A strong and very attractive combined exhaust emission tester for workshops and test stations worldwide.